Harbinger is a popular brand of pro audio equipment sold by many of the chain pro audio stores and there is a lot of it out there. If you have a problem with your speaker, it can be hard to find the replacement parts to get it working again. But you can get your Harbinger speakers back on-line with these easy-to-install replacement speakers. These are direct replacement parts. 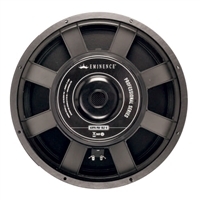 Check your Harbinger speakers carefully to be sure that you order the right replacement parts. Sometimes the model looks the same but is an upgraded version. If you don't see the speaker that you need, give us a call at 1.866.963.0733 for more information.